Chimalfe Patagonia Lodge is located at Yelcho Lake which is a large Fiord-shaped lake located in Chilean Patagonia, in southern Palena province of Los Lagos Region, Chile. The lake receives the waters of the Futaleufu River at its southern tip, near the tiny settlement of Puerto Ramirez. The river then flows northward through mountainous and glaciated terrain, until it outflows via the Yelcho River north-west and empties into Gulf of Corcovado, near Chaitén. Typically, guests came from Santiago, and on through Puerto Montt (Tepual Airport) then to La Paloma Airfield (from Tepual Airport to La Paloma Airfield takes approximately 20 minutes depending on traffic) and then to Chaiten Airport. If you arrive to Puerto Montt in the afternoon, we highly recommend that you spend the night in Puerto Varas. Puerto Varas has several high quality Hotel accommodations. The city center is small and cozy and local attractions are at walking distance. Local dining and Casino is quite attractive. From Puerto Varas to La Paloma Airfield in Puerto Montt takes approximately 30 minutes. Flights from La Paloma Airfield to Chaitén leave at 9:30 hours every morning and you must show up to 45 minutes before departure. There are two reliable airlines that fly this route. www.aerocord.cl and www.pewenchile.com. 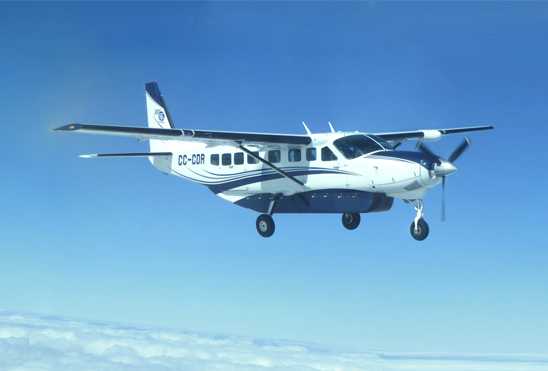 These airlines fly Cessna Grand Caravan 208B and Twin Otter DHC-6 aircrafts. Members of our guide staff will be waiting for you at Chaiten Airport to take you to the Lodge, on a 45 minutes drive, passing through the town of Chaiten which is being rebuilt due to the 2008 eruption of the volcano with the same name. The Back to Reality Day starts with an early breakfast at 8:00 hours and a trip back to the Chaiten Airfield, driven by our staff. Flights back to Puerto Montt are available from Monday to Saturday at 10:30 hours. We advice to book your flight from Puerto Montt to Santiago under a flexible modality, and after 16:00 hours, considering that delays may happen because of the weather conditions in Chaitén and/or Puerto Montt.